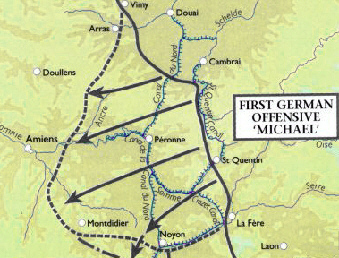 The first of Ludendorff's blows was Operation Michael against Fifth Army, commanded by Hubert Gough. The division had been shifted southward after its depletion in the opening of the Battle of Passchendaele the previous summer. It was hit after a whirlwind bombardment at dawn on March 21st in thick fog. Gough had tried to build a defence in depth, but the fog, which dissipated during the morning, produced excellent cover for the fast moving storm troops, and in many cases they appeared out of the fog BEHIND the British troops who were out of sight of their companions. Consequently, many units surrendered in quantity, and Gough's line was severely dented to a maximum depth of some thirty-five miles. Despite the retreat, the line never quite broke, and the attack ran out of energy. The Allies responded by reorganizing under the supreme command of Ferdinand Foch. Third Army to the north counterattacked, and French reinforcements helped buttress the southern shoulder of the salient. A new line held when the assault ceased on April 5th. It had cost the Allies and the German Army, some 250,000 casualties each, but the Germans had failed to take decisive, war-winning territory and now had to garrison an extended perimeter. The next major German assault was due to strike on April 9th in Flanders. Gough was sent home and then spent years defending his actions during these momentous days and also his good name. In my personal opinion he was made a scapegoat by more senior officers and also Lloyd George, the Prime Minister. The background and details of the first day's battle is well documented in The Kaiser's Battle by Martin Middlebrook. Gough outlived most of his critics and contemporaries and died in 1963. This is a survey history of the vast Eastern front, extending for nearly 1200 miles from the Baltic to the Black Sea across the Polish plains through the Pripet Marshes, the oil fields of Silesia, the Carpathian Mountains and the Iron Gates of the Danube and the Romanian Dobrudja. Nearly all the combatants on both sides were represented here: Russia, Germany, Austria-Hungary, Rumania, Bulgaria and Turkey. Even the British and French had limited land and naval forces engaged by the end of the war. Huge armies grappled in the east. The Germans alone had as many as two million men engaged at the height of the fighting, suffering over a million casualties over four years. Austria-Hungary had over forty-four divisions, half her army, deployed against Russia, which, in turn, deployed nearly half of her 294 divisions against the Germans and Austro-Hungarians. Casualty figures for Russia are unreliable but go as high as ten million military and civilian dead. Civilian losses, particularly among the hundreds of thousands of refugees (many of them Poles, Lithuanians or Ukrainians) displaced in the deep Russian retreat of 1915, are impossible to determine. The author starts his survey with a review of the strategic position of the protagonists in 1914, moving through the overwhelming German 1914 victories at Tannenberg and the Masurian Lakes, the 1915 battles in Galicia and the Carpathians, the Brusilov Offensive and the defeat of Rumania in 1916, the disintegration of the Czarist army and government in 1917, to the post-1918 battles between the Red Army and the newly independent Polish state, the Rumanian invasion of Hungary and the actions of German Frei Korps, in the Silesian Plebiscite War of 1921. Also covered in useful detail are command rivalries within the Imperial German and Russian Armies and between the German and Austro-Hungarian commands, as well as the various treaties (Brest-Litovsk and Bucharest) ending the conflict. In all, this is a valuable addition to the slim library of WWI Eastern Front histories* and well worth reading. Weaknesses include the maps (which though plentiful and detailed are monochromatic and hard to decipher) and exclusive reliance on secondary sources. 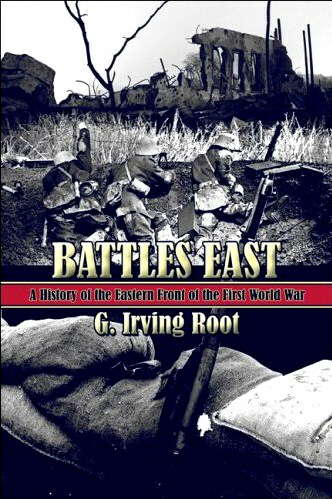 Battles East: A History of the Eastern Front in the First World War, G. Irving Root, Publish America, 2007, 387 pages, bibliography, maps, ISBN 1 4241 6800 7, $24.95 paperback. Order from (link). It's been a while since the last Great War Society National Seminar, three years in fact, but once again I'm putting together the film festival that will run concurrently with the lectures as well as in the evenings. The dates are April 11-13 for the Fifteenth Annual Seminar, and the overall topic is World War I in the Air and Sea. Here's what you can expect when you attend. The daily programming will total approximately twenty hours of feature films and documentaries on naval and air warfare. Some not commonly available documentaries and archival footage will be shown. There'll be episodes from "The Century of Warfare", "The Century of Flight" and documentaries from the Canadian Film Board. Topics will include U-boats, the Lusitania, the Battle of Jutland, naval codes, the Red Baron, airships and the Lafayette Escadrille. The feature films tentatively scheduled include Hell Below (1933), Ace of Aces (1933), Aces High (1976) and Forever England (1935). If there's time Attack of the Hawkmen, a "Young Indiana Jones" adventure that features the Red Baron and Anthony Fokker will be included. Our evening screenings will be on "The Fantastic Cinema of the Air and Naval War of World War I." Audience members will be confronted with German super weapons, time travelers, ghosts and dinosaurs! Friday night we'll be taking to the air for Biggles: Adventures In Time (1986), based on the popular "Biggles" series by "Captain" W.E. Johns. This film is not a classic but is certainly entertaining--recounting a mission to destroy a German secret super weapon that runs into interference from an unintentional time traveler. 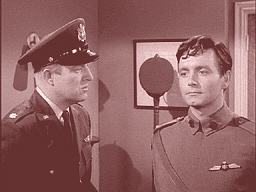 Following Biggles is The Last Flight, a "Twilight Zone" episode from 1960 written by Richard Matheson. The story is that of a World War I British fighter pilot who flies away from a dogfight in 1917 and lands at a modern American air base in 1959. He must decide whether or not to return to the past and his possible death in order to maintain the existing future. The vintage Nieuport in the episode was flown by legendary stunt pilot Frank Tallman. We'll close our program that night with a rather bizarre short subject, So Quiet On The Canine Front, a 1931 version of All Quiet On The Western Front but featuring an all-dog cast. After the banquet on Saturday we dive beneath the sea to face dinosaurs and ghosts! First up is The Land That Time Forgot (1975) based on the 1918 novel by Edgar Rice Burroughs. 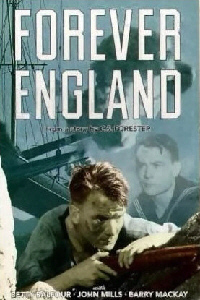 The crew of a German U-boat and the survivors of a torpedoed freighter team up to survive in a lost land inhabited by dinosaurs and cavemen. The screenplay is by the noted science fiction/fantasy writer Michael Moorcock. Then it's back to the future for a 1966 episode of "Voyage To The Bottom Of The Sea". In The Phantom Strikes, the futuristic nuclear-powered submarine Seaview is menaced by the hulk of a World War I U-boat and its supernatural one-man crew, the ghost of Captain Krueger. Can the crew of the Seaview survive when the Phantom strikes? Saturday night attendees will find out! And to close the evening, there's another unusual short, War Babies (1932). A four-year-old Shirley Temple headlines an all-diaper-clad cast in a one-reel version of What Price Glory? produced as one of the "Baby Burlesk" comedy series. The following are thanked for their contributions to this issue of the Trip-Wire: Len Shurtleff, Tom Jones, Diane Rooney, Ralph Koch, Tom Jones, Steve Miller, Tony Langley, Christina Holstein, Tony Noyes, Andrew Melomet, Kimball Worcester and my pal, Maggie Haas. Until next month, your editor, Mike Hanlon.